Those with long memories will recall a time when Space Invaders and Donkey Kong cabinets were the entertainment of choice if you wanted to spend your money on a game with a screen. Less widely known is that this was also the era when Video Poker began to make a first, halting appearance. Video Poker is genre of casino gaming which deserves an explanation of it’s own and the popularity of this variant dates from the release of Draw Poker in 1979. IGT developed this game (although they were known as Si Redd’s Coin Machines at the time) and it became the driving force behind the boom in Video Poker in casinos through the 1980s. Of course these games are also available online in exactly the same format and these are listed in the table below. Variations in the rules can create a bit of interest in a particular game, for example in Jacks Or Better & All American Multihand the weakest winning hand is a pair of Jacks or better compared to Three Of A Kind playing Deuces Wild. 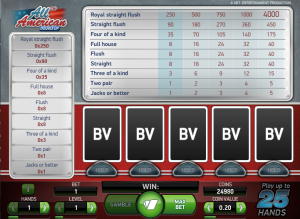 Have a look at our video poker strategy page to get the best value from your bankroll.